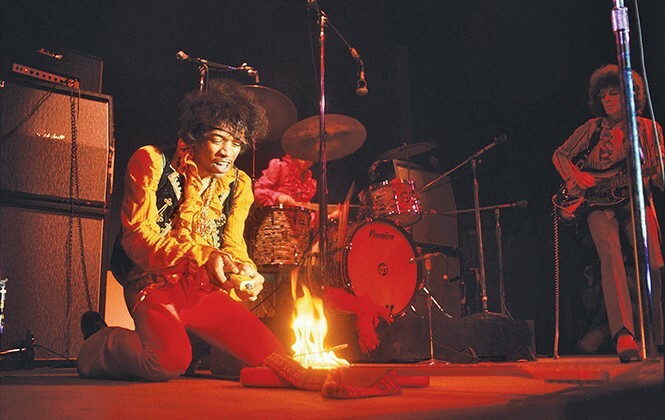 Fifty years on, Monterey Pop captures something that was more than a musical moment. Director D.A. Pennebaker launches into the documentary Monterey Pop by playing Scott McKenzie's recording of the hippie anthem "San Francisco (Be Sure to Wear Flowers in Your Hair)" over images of people gathering for the landmark Monterey International Rock Festival—and with 50 years of distance from the event, it's easy to look at that choice with a bit of cynicism. The song was written by John Phillips—frontman of The Mamas & The Papas, as well as one of Monterey Pop's co-founders—specifically to help promote the three-day June 1967 festival. Pennebaker was recruited to chronicle it for a movie, a decision smacking of enough commercialism that it reportedly led to the Grateful Dead's decision not to allow their performance in the documentary. Was the Summer of Love just an opportunity for savvy businessmen to capitalize on a demographic shift? As a film, Monterey Pop feels like a repudiation of that idea, even if there was no way for Pennebaker to know it might ever be considered. It feels like something of a minor miracle that it exists at all, given that Pennebaker and his crew essentially had to invent the synchronized 16 mm cameras that would allow them to capture the performances, with a new color film technology that made it possible to shoot the evening sets. It was groundbreaking in its you-are-here approach to a major live-music event, making possible later efforts like Woodstock and the Maysles brothers' Gimme Shelter (Albert Maysles served as one of the cinematographers here). Pennebaker, however, watches the way a spectator in the crowd would likely perceive. He doesn't keep his eye on lead singer Marty Balin of Jefferson Airplane—not when Grace Slick is right there to be the magnetic focus. The Who's performance of "My Generation" isn't all about singer Roger Daltrey or even the guitar-smashing Pete Townshend; Pennebaker spends more time watching the crazed drum-pounding of Keith Moon than the other two combined. As indelible as many of the individual images are, the magic more often comes from Pennebaker's sense for knowing when to tell his viewers, "OK, but now take a look at this." Beyond the music performances, of course, is the "happening" of the festival itself, which one blissed-out young woman describes at the outset as "like Easter and Christmas and New Year's and your birthday all together." Monterey Pop captures a cultural moment as much as it captures an artistic moment, and Pennebaker, even in that moment, seems to grasp that intuitively. He pokes his nose behind the scenes to show the logistics of police trying to prepare for the thousands of attendees descending on Monterey without much infrastructure to support them, and the festival-goers living in makeshift tent cities or setting up tables to sell flowers. For much of the running time, it feels like even more of this background texture is needed. There's something happening here, to quote Buffalo Springfield, and we want to understand what it is. Pennebaker ultimately nails it during the film's improbable climax, where he devotes 17 minutes of a 78-minute feature to a single song by Indian sitar player Ravi Shankar. The music initially plays over images of festival-goers doing everything from praying to sleeping; Pennebaker waits eight minutes before even showing Shankar's face. Yet it's intoxicating watching a rapt festival crowd embrace these strange rhythms of a musician who was not a radio idol or a rock god. When the attendees erupt into a prolonged standing ovation at the end of Shankar's song—even Micky Dolenz of The Monkees can be seen in the audience, losing his mind—the genuineness of the moment is impossible to ignore. Before it was a shorthand for Baby Boomer self-indulgence, this "love-in" was real.